ALL SCHOOL FIELDS ARE OPEN FOR PRACTICE. SOTO FIELDS ARE NOT OPEN UNTIL MARCH 3 AND SHOULD NOT BE USED. COACHES GOT TEAM CONTACT INFO LAST NIGHT. ALL COACHES SHOULD BE CALLING THIS WEEKEND. 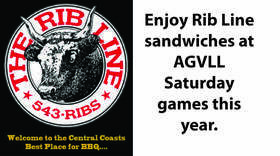 Ribline will at our Saturday games this year serving their delicious food. A portion of the proceeds will go back to the AGVLL. Arroyo Grande Valley Little League is proud to announce beginning in the 2013 season the Intermediate division for 11 and 12 year olds will be playing 50/70 baseball. The division will be for 11 and 12 year olds only and will include things like pitching from 50 feet, 70 foot bases, lead-­-offs, dropped 3rd strikes, and a full season of competitive baseball concluding with playoffs and crowning a champion. This Division will have a continuous batting order during the regular season and go to a 9 person order during post-season playoff. 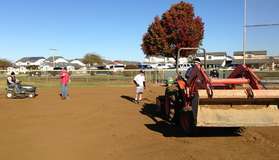 The AGVLL volunteers were busy recently preparing for the season by adding new dirt, repairing the fences and manicuring the bullpens. It's going to be a great season. We can't wait to see you out there! THANK YOU SMART AND FINAL!! AG LITTLE LEAGUE WOULD LIKE TO THE THANK SMART AND FINAL FOR THIER SUPPORT OF AG LITTLE LEAGUE.